The Government of India has enacted the Real Estate (Regulation and Development) Act 2016 and all the sections of the Act shall come into force with effect from May 1, 2017. Under this Act, Government of Maharashtra established Maharashtra Real Estate Regulatory Authority (MahaRERA), vide Notification No. 23 dated 8 March 2017, for regulation and promotion of real estate sector in the State of Maharashtra, with its headquarters at Mumbai. The MahaRERA authority provided citizens the complaints filing service, as per the Act, wherein any aggrieved person may file a complaint with the Authority or the adjudicating officer, as the case may be, with respect to any registered real estate project, for any violation or contravention of the provisions of this Act or the rules and regulations made there under. The authority has been swift in handling complaints and delivering verdicts. But it was observed that many complaints were finally withdrawn after the complainant and respondent reached an agreement. As per Section 32 (g) of the Real Estate (Regulation and Development) Act 2016, Maharashtra Real Estate Regulatory Authority must take measures to facilitate amicable conciliation of disputes between the promoters and the allottees through dispute settlement forums set up by the consumer or promoter associations. 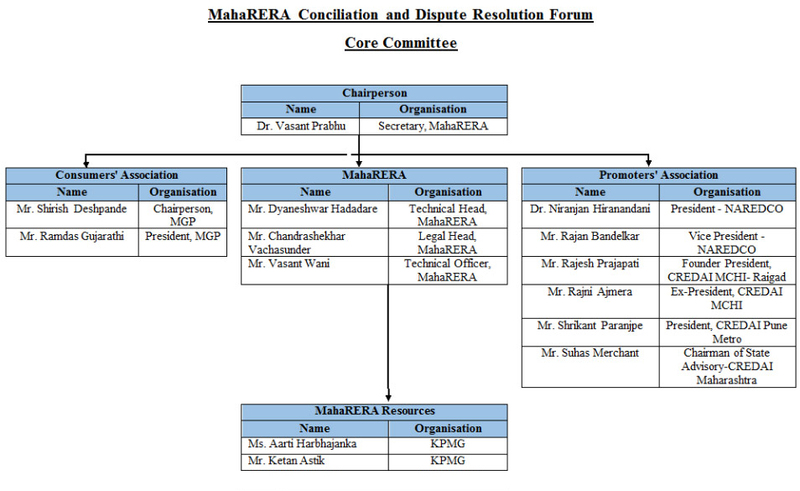 With this objective, it was proposed to establish MahaRERA Conciliation and Dispute Resolution Forum that shall facilitate resolution of disputes amicably, thereby saving cost and time of litigation to parties and State, promoting greater public satisfaction with legal system and dispute resolution. Under the mechanism of the Forum, if the parties don’t reach a consensus, the allottee(s) will have the possibility to lodge a formal complaint against the builder via MahaRERA Complaints Portal. Constitute / establish panel of eminent Conciliators representing different stakeholder groups. To promote and popularize the amicable and effective settlement of disputes arising with reference to Real Estate ( Regulation and Development ) Act 2016, with various Alternate Dispute Resolution (ADR) mechanism. To popularize conciliation as an effective dispute resolution mechanism with moderate cost (cost effective) and speedy settlement of commercial disputes. To co-ordinate/assist ADR proceedings by establishing facilities and providing administrating services. Finally providing the best platform for ADR.